LONDON, UK, and SINT-NIKLAAS, Belgium, 19 September 2016. 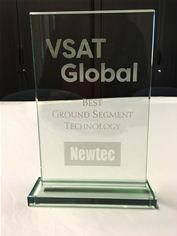 Newtec, a specialist in designing, developing and manufacturing equipment and technologies for satellite communications, has been presented with the “Best Ground Segment Technology” award at the VSAT Stellar Awards for its dynamic Mx-DMA® bandwidth allocation technology. A key staple of the Newtec Dialog® platform, Mx-DMA combines the best of both SCPC and MF-TDMA return link technologies, solving the difficult choice of selecting one or the other. The awards, which were presented as part of the VSAT Global event in London, recognize the key individuals and companies leading the satellite industry into the future. Mx-DMA seamlessly adjusts the frequency plan, symbol rate, modulation, coding and power level for every terminal in the satellite network, every second. This flexibility allows Mx-DMA to dynamically allocate bandwidth based on real-time terminal demand, while also adapting to changing RF conditions. While Newtec Dialog also supports traditional SCPC and MF-TDMA return technologies, Mx-DMA provides a “best of both worlds” solution for many applications, resulting in bandwidth savings of more than 50%. Supporting upload throughputs as high as 75 Mbps, Mx-DMA is providing unprecedented speed, efficiency and service availability and is very well suited for mobility, cellular backhaul, enterprise, broadcast and government applications. For more information about Mx-DMA and Newtec’s solutions using the technology, visit www.newtec.eu/technology/mx-dma.